Never Get Lost Again With the easiest to use personal location finder. Just mark the location and BackTrack will help you get back. Use it at the shopping mall and stadium parking lots, at the festival, the park, for travel or you next outdoor adventure. The unit uses GPS technology in an easy to use, hand held format. 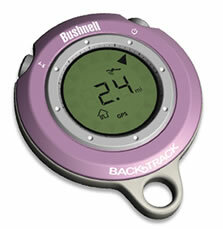 Simply press one button to save the location and Bushnell BackTrack will guide you back to that point with clear and direct instructions.